If we pay close attention to the verse, we will see that mountains’ property of preventing shocks on earth is mentioned. 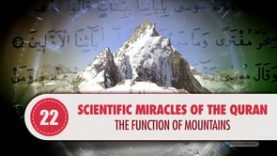 This fact, which was unknown by anyone during the period when the Qur’an was revealed, has been exposed as a result of the discoveries of modern geology today. In the past, it was thought that mountains were merely protrusions rising above the surface of the Earth. However, scientists noticed that this was not actually the case, and that those parts known as the mountain root sometimes extended down as far as 10-15 times their own height. With these features, mountains play a similar role to a nail or peg firmly holding down a tent. For example, Mount Everest, the summit of which stands approximately 9 km above the surface of the Earth, has a root deeper than 125 km. Besides, mountains come into existence as a result of the movements and collisions of massive plates forming the Earth’s crust. When two plates collide, the stronger one slides under the other, the one on the top rises by bending down and forms the mountains. The layer beneath proceeds under the ground and makes a deep extension downward. The fundamental difference between continental mountains and the oceanic mountains lies in its material. However, the common denominator on both is that they have roots to support the mountains. In the case of continental mountains, light-low density material is extended down into the earth as a root. In the case of oceanic mountains, there is light material which supports the mountain as a root. According to the law of Archimedes, the function of the roots is to support the mountains. The effect of mountains on general stabilization of the earth’s crust is defined as Isostasy. This concept is explained as follows in Webster’s New Twentieth Century Dictionary: “Isostasy is the general equilibrium in the Earth’s crust maintained by a yielding flow of rock material beneath the surface under gravitational stress.” Furthermore, a book titled Earth, by Dr. Frank Press, former president of the U.S. National Academy of Sciences, which is still used as a text book in a great many universities, states that mountains are like stakes, and are buried deep under the surface of the Earth. How could you explain the Qur’an’s explicit declaration of a scientific fact at a time when there was no science and technology while this has just been discovered as a result of modern geologic and seismic researches? Would you believe in Allah who makes mountains as pegs for the earth by saying that this is His book or still close your eyes to this sun and condemn yourself to darkness?